The port was HUGE and it was a bit intimidating riding alongside big freighter trucks. Luckily there was a special lane just for bicycles, or at least a red line painted on the ground for bikes to follow (as seen in the photo above). We waited outside while Danny ran inside to purchase the tickets. I tried my best to keep the kiddos entertained while he took forever getting the tickets. Apparently there was some confusion because the person selling the tickets booked us onto a boat that was just about to leave and they were worried that we wouldn't make it aboard before they alighted. Anyway, it took them forever. After we bought the tickets we made our way over the ramp. There were several rows of cars and trucks and a special row for bicycles and motorcycles. We still had an hour and a half till we started boarding so we parked the bikes and walked over to the waiting area to get a snack and waited until it was closer to boarding time. When we started heading back to the bikes we hear over the intercom that they were going to start loading the bikes and motorcycles. We frantically picked up our speed. We made it to our bikes just as the last motorcycle was veering around us. (We were at the front of the line) then we were signaled to make our way onto the ferry. 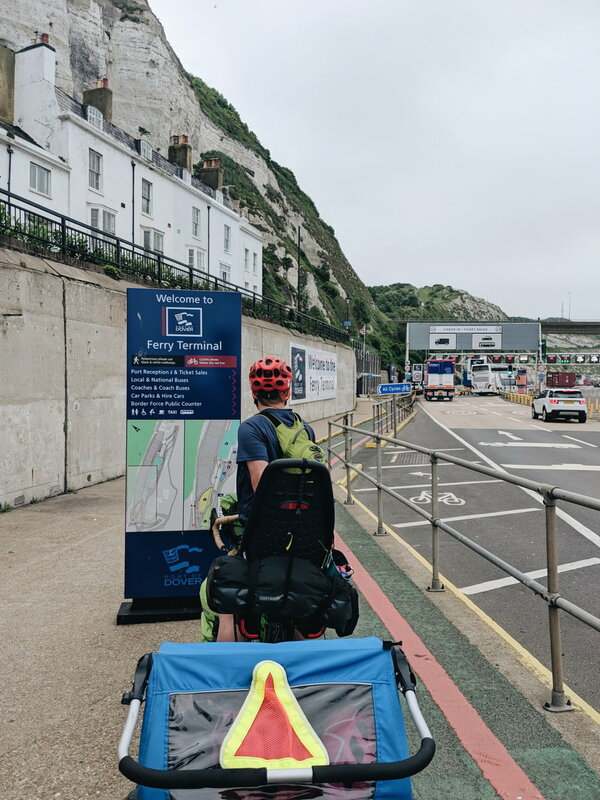 To get into the ferry we had to cycle up a quite steep ramp/gangway into the ferry and walk across what was described as a 'cyclist death trap', which were small slits in the ramp exactly the size of a road bike tire. When we were finally on, we strapped down the bikes and went up to the lounge area to look for a good spot to hold fort. After we found a good spot, Danny took the girls out on the deck to watch the ferry leave the port. It took us about an hour and a half to reach the port of Calais, France. After we got off the ferry we peddled over to a waiting room to charge our devices. (We forgot to switch the plug on our cords and all the converters were in one of our bags on the car level that was shut off to all passengers while sailing). After we had a sufficient amount of charge on our phones we set off inland. It was hard to believe that we were actually in France! I couldn't wait to get my hands on some fresh French bread and cheese. It was so exciting to be following the signs. We had to stop to get a picture with the first 'EuroVelo route 5' sign that we saw. Following the signs, we found a campsite about ten miles south of Calais on the outskirts of a small city called Guînes. The (luxury) campsite was called Camping La Bien Assise. It was nice, definitely not the the sort of camping we're used to from the Western US. Perhaps we should call it a glampsite. The campsite had everything from showers and toilets (sparkling clean) to a restaurant and bar. Not to mention the manor house and its gourmet restaurant (but due to the 45 euro/plate cost we didn't get to enjoy). Despite the site's general glampy-ness, it wasn't too expensive either, coming in at 14 euros for the night. We pitched the tent and hung out for a little bit before heading to the restaurant to make an order for fresh baked baguettes in the morning. Danny went a little overboard and order a baguette and a landslide of croissants and pain au chocolat. 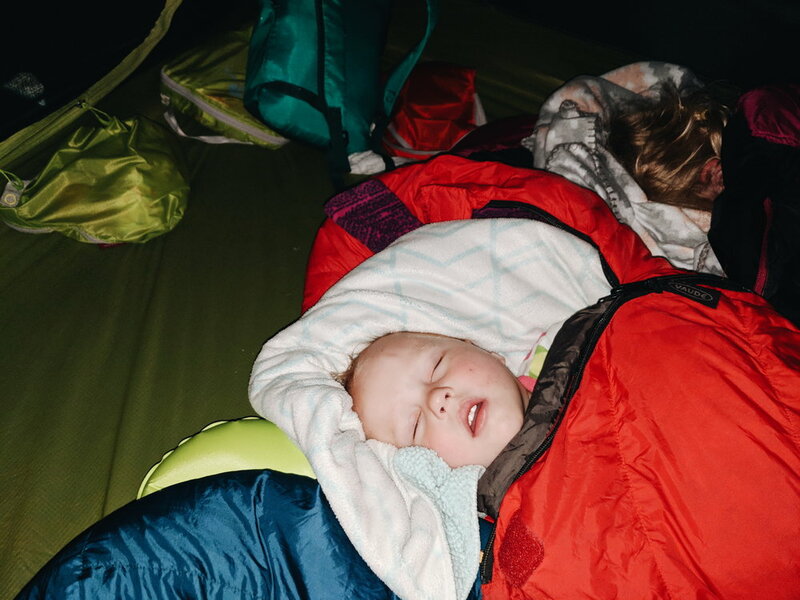 We let the kids go crazy on the playground (oh yeah, the campground had a playground too) for a little while before heading back, taking showers, and tucking in for the night.